Dead Frog Set for a Second Batch of "French Oaked Stiff Stout"
With what looks like another great addition to their successful "BrewMasters Series", Dead Frog Brewery is set to release a second batch of their "French Oaked Stiff Stout". This looks like it will be something worth trying to grad for sure! Don't waste any time trying to get your hands on this one. "We’re trying something new here at Dead Frog. Instead of sending out an exciting press release with random quotes from our CEO we figured we’d send you the straight facts on our product releases with some added tech info. Let us know what you think of the new format! 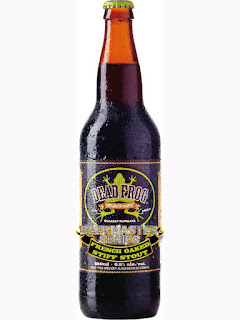 Dead Frog's newest Beermaster Series Brew the French Oaked Stiff Stout is now available across BC and Alberta! The Stiff Stout is a limited edition 650ml single bottle and is available until mid-April while quantities last. The French Oaked Stiff Stout is Dead Frog’s first stout and we can’t wait to see what the craft beer community thinks of it. A full flavoured, smooth stout combining roasted barley and chocolate malts aged on toasted french oak to create a rich, textured beer with a finish so stiff you’ll never forget it! The first batch has already sold out here at the brewery and is currently available at Liquor Stores across BC and Alberta. The second batch is currently being bottled and will start shipping next week. The second batch is being made with the same specs as the first."